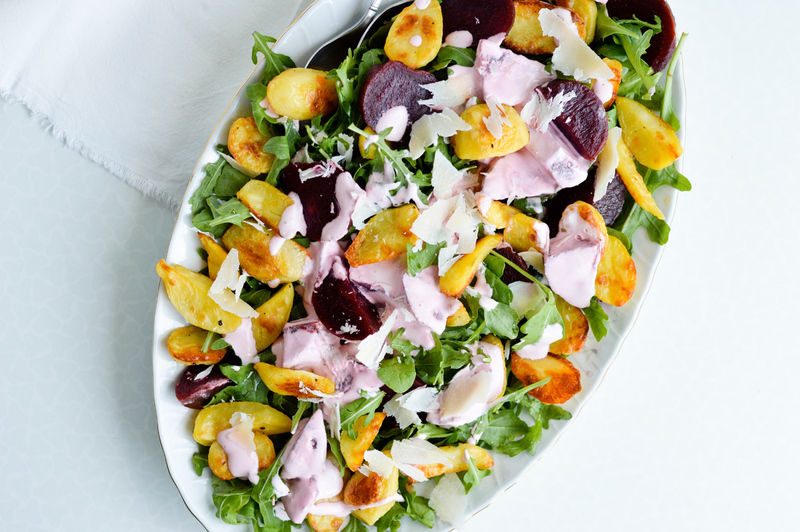 Update classic roasted potatoes with some arugula and beets! This blog barely has any potato recipes and it’s a shame to be completely honest. Because I love potatoes and growing up I think my mom made them part of dinner more often than rice and pasta combined. They scream home to me. I think if I had to live off of potatoes only I could do it. Mashed, roasted, fried and topped with tartar sauce, paired with scallions in a potato salad, …, whew, the list goes on and on. Roasted potatoes with some roasted veggies, like broccoli and carrots, are one of my favorites. Easy to put together and so, so good. 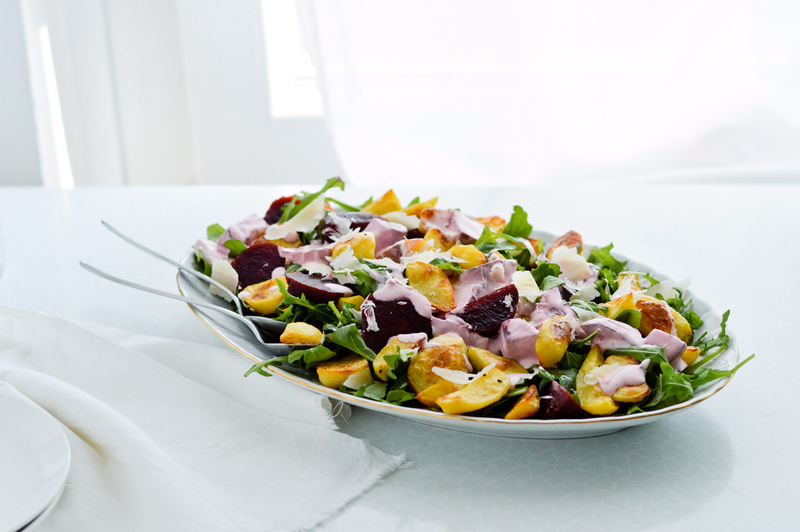 And this salad is a fresher twist on that. It’s actually inspired by a salad Jamie Oliver once made, even though he didn’t include potatoes. But when watching that episode of Oliver’s Twist a while back I just knew I had to make something similar. It’s funny that I even saw this particular episode with the arugula salad. It’s almost like it was meant to be. Because I don’t really watch cooking shows anymore. I’ve just realized that nowadays I only watch them, if I do at all, over the weekends and it’s often not even new shows. I enjoy reruns of older shows like Oliver’s Twist, especially when Gennaro Contaldo is a guest, because that is one funny man. He’s also the reason why I like watching Two Greedy Italians, a show that can be really entertaining. And speaking of cooking shows, or food related shows, I will also watch anything with Anthony Bourdain. The man rocks, I think I can leave it at that. Back to this jewel of a salad. 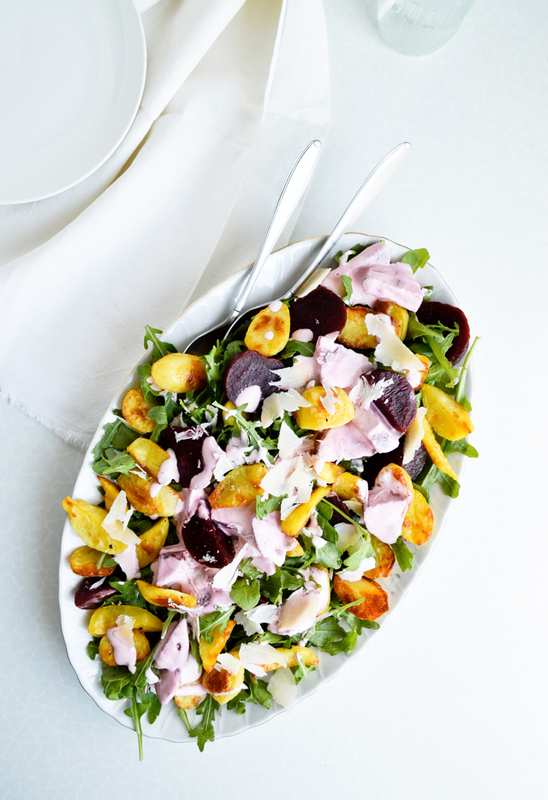 These roasted potatoes with arugula and beets are as much a side dish as they are a salad or even a main course. The dish is made of few components, it’s very easy to put together but is still impressive. 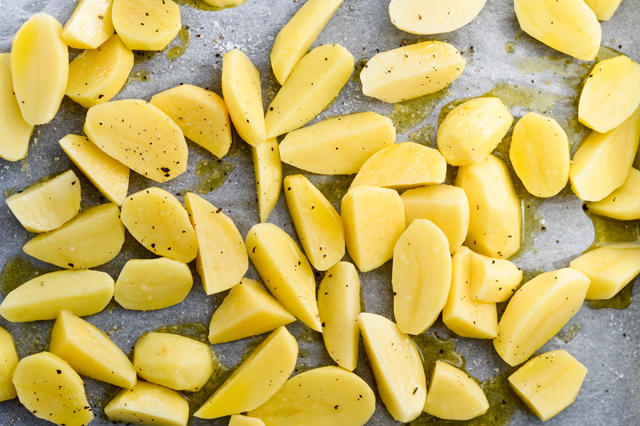 The potatoes are peeled and sliced, uncomplicated, baked in olive oil. They are golden brown around the edges, crispy on the outside but soft on the inside. 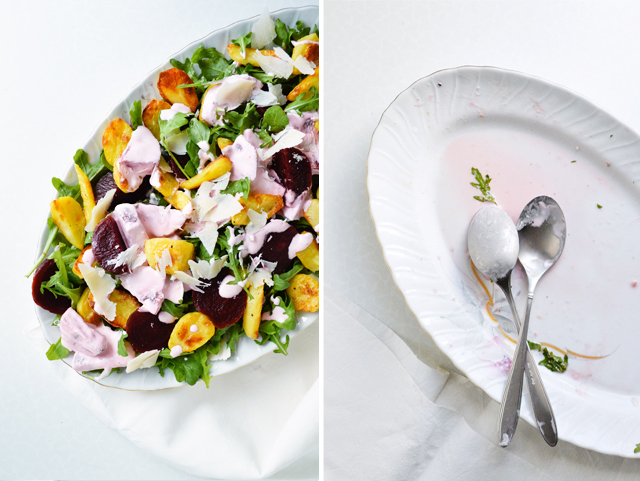 Arugula is fresh and slightly bitter, while the beets are sweet and sour at the same time. 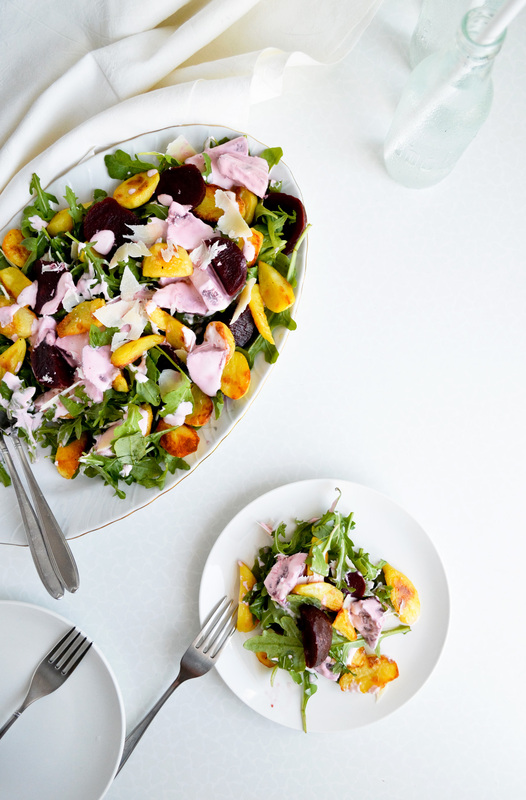 All together these layers make this salad really vibrant and insanely good. Seriously. This dish can be all – a salad, a side dish or even the main course. Preheat the oven to 200°C (392°F) and line a baking sheet with parchment paper. 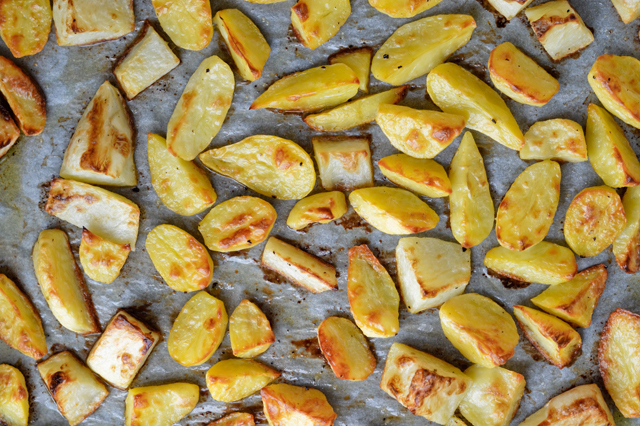 Rinse and peel the potatoes, cut them into quarters (or smaller if using large potatoes) and scatter across the baking sheet. Sprinkle with olive oil, a big pinch of salt and a few grinds of black pepper. Toss until all potatoes are coated. Bake for 20-30 minutes until the potatoes are golden brown around the edges, but can be pierced with a fork. 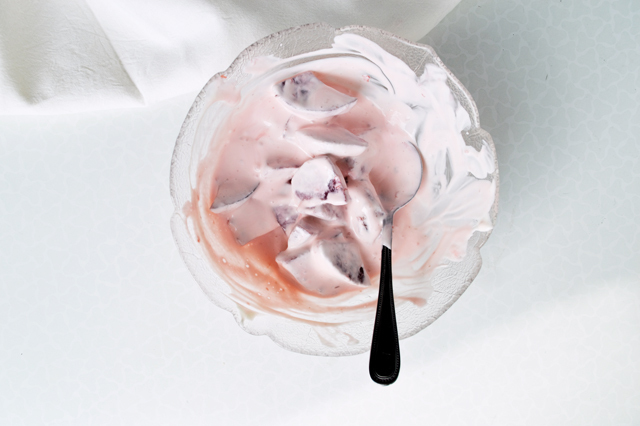 In a small bowl whisk together the sour cream, vinegar, mayonnaise and 1/2 tsp salt. Set aside. 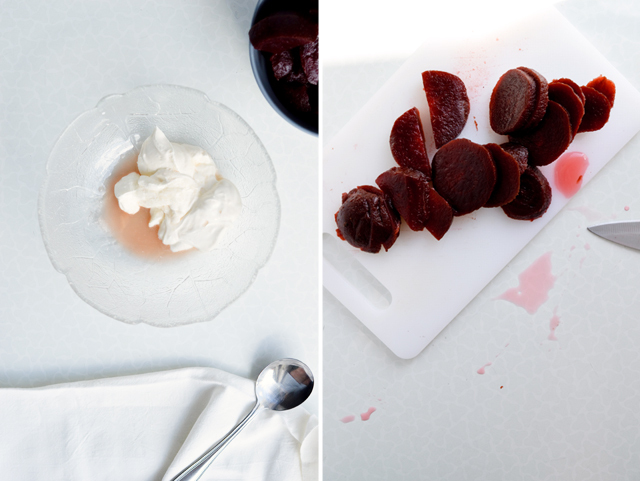 Slice 1 beet in disks and set aside. Chop the rest into wedges and transfer to the sour cream mixture, set aside. When the potatoes are ready, place some on a large plate. Cover them with arugula. 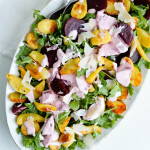 Scatter the rest of the potatoes over, top with beet slices and then with the cream coated beets. Sprinkle with Parmesan shavings. 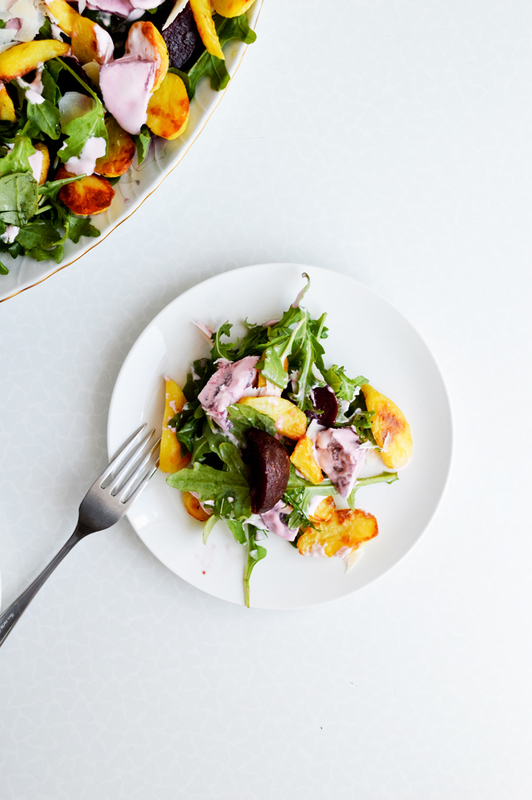 You don’t have to peel the potatoes if you don’t want to, but I love to do that for a salad like this one. Beets usually cook for about 30 minutes, depending on the size. If you are pressed for time or just want to make things easier for yourself you can buy packaged steamed and peeled baby beets that are really great too. Recipe inspired by Jamie Oliver’s Wild rocket salad. Wow- your salad building game is *on point*!